Following your dreams can scare the crap out of you. 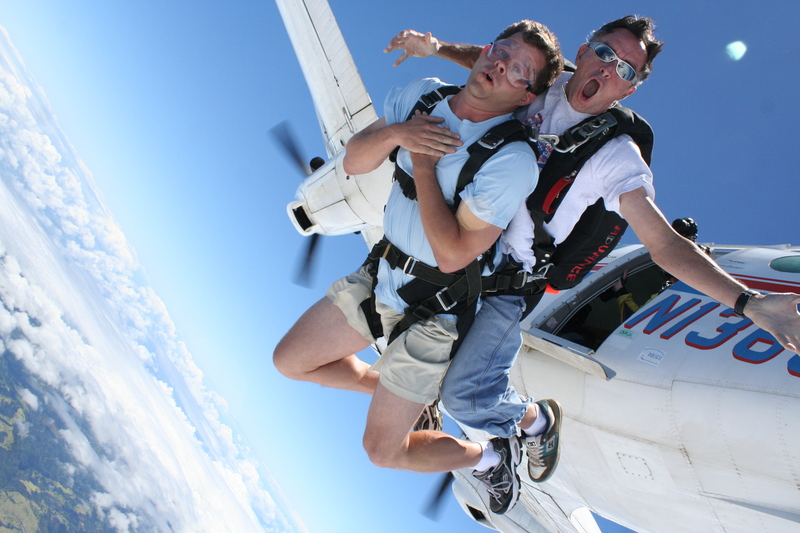 It doesn’t look like I’m having the time of my life, but I did about 2 seconds after this skydiving photo was taken in Oahu last year. For the jump, all the hard work was done at the point you see me there. Signed a million release forms, waited for the plane, took the ride up, and jumped out the door. Just had to enjoy the free fall and trust that the parachute will open. Fast forward to today, I feel much the same way. We’ve sold our house, sold most of our stuff, taken a pay cut, and left our friends. We are locked and loaded, and all we need to do is get on the plane in a couple days. I’m not second-guessing at all. In fact, I’m excited to get on the plane and get there. I suppose I’ll get this look off my face once I have a house and a mai tai in hand.